Leave your traditional popcorn behind… This Toasted Coconut Kettle Corn is sweet and salty and bursting full of coconutty flavor! Read below on how to easily whip up this recipe at home. As coconut lovers, we make any excuse to add delicious coconut flavor into our favorite recipes. 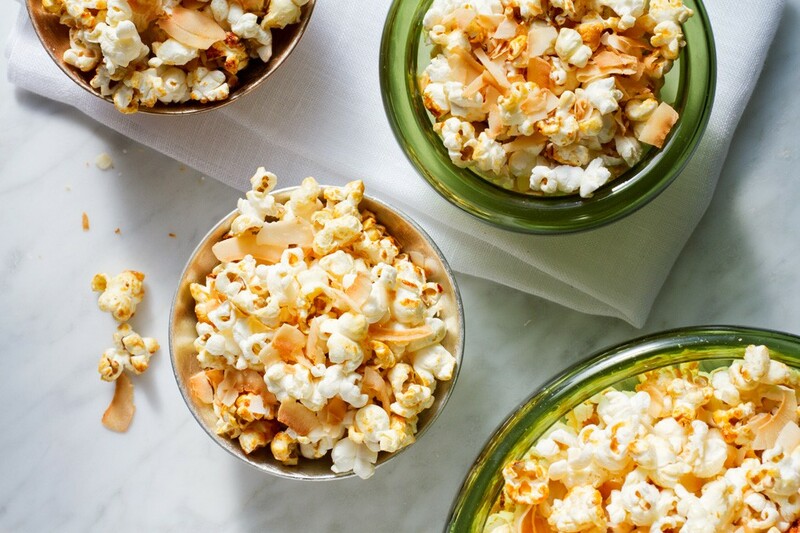 This Toasted Coconut Kettle Corn is no exception! Made with Grove Harvest™️ Toasted Coconut Chips, almonds (we recommend nuts toasted and coconut flavored! ), granulated sugar, coarse sea salt, coconut oil and last but not least — popcorn kernels! Each ingredient acts as a layer of flavor in this indulgent, ‘good for you’ snack. We’ve even swapped out olive oil for coconut oil to add in an extra dose of coconut flavor throughout each bite. Start by heating the oil over the stove top on medium to high heat and adding the kernels. Wait until the coconut oil is sizzling and then sprinkle in the sugar on top of the kernels. Wait a few minutes until the popping slows down and remove from heat. Toss into a large bowl and sprinkle with salt. It’s almost ready to eat! Skip the hassle of toasting raw coconut by grabbing a bag of Grove Harvest Toasted Coconut Chips. Toasted to perfection with the right level of crunch, our Toasted Coconut Chips save you time without sacrificing flavor. If you’re feeling ambitious, try making these Toasted Coconut Almonds for extra flavor! Once the almonds are finished, simply add them and our coconut chips into the kettle corn and voilà! — you have yourself a tasty, sweet and salty snack for any season. Enjoy during movie night, as a healthy dessert or bring as a side dish to any special occasion! 1. In a stovetop popcorn cooker or in a large pot with a lid, heat the coconut oil over medium-high heat. Add the popcorn kernels. 2. When the coconut oil sizzles, sprinkle the sugar over the popcorn kernels. Cover and stir or shake the pan until the popping slows down. NOTE: The popcorn should be done popping in about 2 minutes. 3. Remove from the heat and pour the kettle corn into a large bowl. Sprinkle with salt and toss. Add Grove Harvest Toasted Coconut Chips, almonds and ENJOY! * NOTE: Kettle corn will last for 2-3 days. Store in airtight container or Ziploc bag.